Troy Hedgren landed in the all-star cheer world by chance, but he nailed it. Today he’s one of four co-owners of the rapidly growing Pacific Coast Magic program, but the former gymnastics coach first started his entrepreneurial career at age 19 with the Tumblebus, a mobile gymnastics school for pre-schoolers. In 1995, he sold the venture (which by that point had grown to three gym buses) to open his first gym, Gymnastics 4 Kids, with his wife Keri. While sponsoring the local Pop Warner cheer team at a competition, the Hedgrens ran into one of Keri’s former gymnastics students, whose parents clued them into the competitive all-star world of tumbling, stunting, dancing and flying. The Hedgrens took the bait, adding their first cheer team in 1997. By 1999, it made sense to change the gym’s name to Magic All Stars, one of the first gyms of its kind in Orange County. 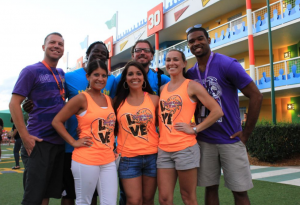 By the time Jarrett and Kellie Elliott (the latter a former college cheerleader) opened their all-star gym Pacific Coast Cheer in Murrieta in 2005, the emerging all-star industry was already changing with some smaller gyms consolidating and gaining presence in the industry because of multiple locations. Pacific Coast Magic emerged in 2008, combining the two gyms under one umbrella. Troy and Kellie had judged competitions together for years and felt confident about their joint prospects. “We knew we wanted to get bigger and stronger and felt like the best way to do that was to combine our strengths,” shares Troy. With increased numbers came better buying power, which helped the gym with everything from cutting costs on uniform essentials to adding additional locations. Owners of smaller, independent gyms started contacting the PCM team about the possibility of partnering or just straight out asking them to buy their struggling gyms. As a result, the all-star cheer gym has grown to seven locations in seven years: seven in California (Anaheim, Corona, Irvine, High Desert, Murrietta and Vacaville) and the most recent in Scottsdale, Arizona. The most obvious advantage of joining forces was the bigger talent pool for creating elite competition teams, as well as the ability to utilize all the coaches’ individual strengths company-wide. Since the merger, PCM teams have secured bids for Worlds yearly. With the added training centers, PCM anticipates training 1,000 or more athletes next year in anticipation of Worlds, nearly doubling their arsenal. Hedgren says the key to the merger’s success has been ensuring consistency throughout the organization in both training and business operations, procedures and centralized bookkeeping—while ensuring that they didn’t strip each individual brand of its personality. “We had to make sure we didn’t lose the gym’s individuality, but we wanted it all to identify with PCM and embrace the best of both of those things,” Troy says. However, it hasn’t all been pleasant turns of fate since opening PCM. In late 2012, one of their athletes, 17-year-old Danika Rae Tibayan from the Anaheim gym, died from a severe asthma attack. She had competed as an International All-Girl Level 5 All-Star in 2011 and 2012. “It was a very trying time because obviously losing any young athlete or child is never easy, but I think what it did for PCM is that it reminded us that while we are growing and we want to continue to grow and get stronger, we never want to lose that family feeling from our core values,” says Troy. At a competition just days after Tibayan’s death at the Citizen’s Bank Arena in Ontario, Calif., the PCM family wanted to find a way to honor their fallen friend. They spoke to the event’s producer and organized a 10-minute break in the festivities for a prayer circle around the Tibayan family, who were in attendance. But what they thought would be a PCM moment of grief and healing turned into something much larger as the rest of the attendees joined them, forming a huge circle of support.